For nearly 30 years, The Walt Disney Company has dedicated time and talent to Children’s Hospital Los Angeles (CHLA), bringing happiness, hope and laughter to children and families when they need it most. On Monday, we continued the tradition by teaming up with Skype to connect the stars of Marvel’s Thor: The Dark World with some very special VIPs. Patients at the Los Angeles-area hospital attended the U.S. premiere of the film with a little magic and the help of an oversized monitor that virtually whisked them to the glitz and glamour of the red carpet. The action wasn’t just limited to the screen. Thor: The Dark World stars Chris Hemsworth, Tom Hiddleston and Sir Anthony Hopkins chatted directly with patients via Skype as they made their way down the red carpet, answering questions and trading stories with the guests of honor. After the children spoke with the actors and actresses who bring these characters to life on screen, they received a visit from Thor, who joined them at the hospital for their very own premiere of the film. This evening was simply another part of a great longstanding relationship between The Walt Disney Company and CHLA. For decades, we have been entwined in a mission of compassion and care, as Disney characters have made rounds a little brighter while Disney VoluntEARS have given their time and raised money for the hospital. 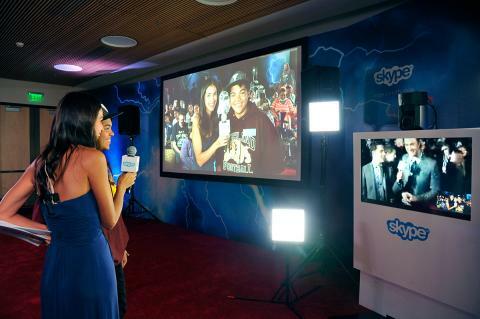 Monday’s collaboration with Skype at the Thor: The Dark World premiere is another example of how CHLA and Disney create out of this world experiences for some very special children.